Shifting consumer habits, driven by mobile and connected TV, are opening up new opportunities in niche media. Look no further than New York, the live theater capital of the world, where Broadway shows grossed nearly $2 billion last year. The problem for many consumers, of course, is that you have to be in New York City to see a show -- and even when you are, with ticket prices averaging over $100 each, shows simply aren’t as accessible as many producers and actors would like them to be. That opportunity was where BroadwayHD came in. 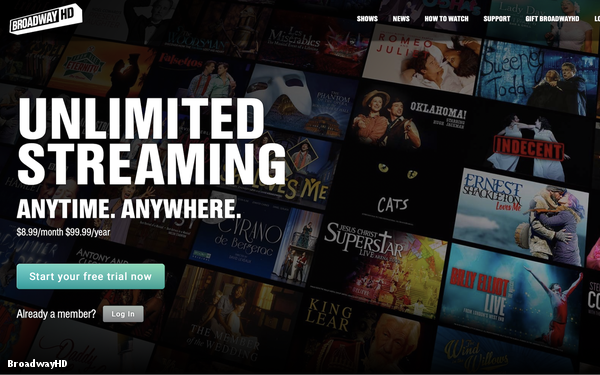 A subscription streaming video service, it now has nearly 300 full-length Broadway shows. “This popularity and technology converged at a time when we felt that there would be enough of an audience out there to make it accessible and affordable, because Broadway is a brand in itself,’ says BroadwayHD co-founder Stewart Lane. "The power of the Broadway brand, globally, is huge,” adds BroadwayHD’s other co-founder Bonnie Comley. BroadwayHD launched with around 100 shows, and that number has since swelled to 300, with more being added monthly. The service has also live-streamed some performances, and is now available in 20 countries. At the same time, the company is embracing its role as a smaller player in a much larger media ecosystem. “We don’t expect to compete with the streaming giants in terms of the number of hours -- it is a niche market,” Lane says, noting that Netflix and other streaming video platforms have enormous libraries, although they are often lacking in live theater options. That being said, the company is open to bundling possibilities, such as being included in a bundle of video content, but Lane and Comley say they are happy to have that direct-to-consumer relationship. Similarly, while they don’t have any immediate plans to add sponsorships or advertising to the platform, they remain open to the possibility… provided it doesn’t interrupt the experience for viewers. Whether or not to lean into ads is a question being asked across the streaming landscape, from niche players like BroadwayHD to major giants such as Netflix. Ultimately, as consumers embrace streaming, giants like Netflix and niche services such as BroadwayHD are poised to benefit -- even if those niche subscriptions may be splintered.